On the heels of the Slytherin Socks, Hurray Hufflepuff! Eva’s Shawl is pretty in crochet. Example here. Cyanne is more crochet! A pretty and colourful bed throw. Here’s a cute Happy Star Felt iPod Cozy, a Nintendo Perler Bead Coaster Set and Kimono inspired hoodie from Craftster. Here are some patterns I missed from DROPS fall 07/08. There are Felted slippers, Felted slippers in 2 threads, Texture knit mittens, Long socks with cables and folded edge, and Long jumper and hat in 2 threads. I’m dipping into the old patterns I never got to last year and was keeping for a dry spell! Knitting pattern designers, post more free patterns! Fortunately, the backup patterns are super cute. Here’s Pretty Miss Bubby and a Santa Helmet. A Very Parental Edition of Yarnival! Howdy, folks! I decided to have a go at editing Yarnival again. It’s been a while! But it was fun. Thanks so much to all those folks who submitted their blog posts. This one has a parental theme, in honour of Mother’s Day. The feature article is Dr. G’s Memory Vest at Through the Loops. Dr. G’s memory is being ruthlessly robbed of him by Alzheimer’s. By leaving a donation, you are supporting The Fisher Center (an Alzheimer’s research center) and being given an absolutely beautiful sweater pattern. Give what you can. The second feature is from the chemgrrl chronicles. Not necessarily about parenting, but I love science like a motherblather. Which is close. Check out the chemistry behind wool and blocking. 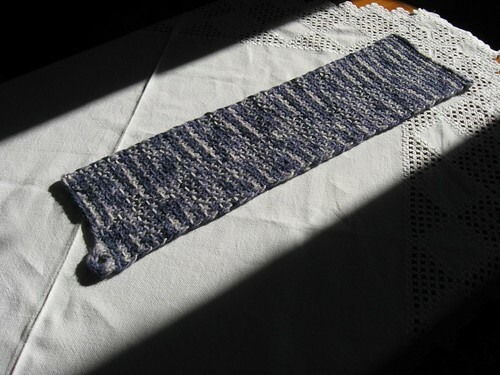 A Friend to Knit With has a post about a handknitted dress knitted by dear old Mom. Grab a pattern for a Winged Mom Heart Tattoo at anny purls. Here’s a touching story about a blanket and parental memories at Yarn~Knit~Read~Lit. Strands Of Me has a pattern from a mom to a daughter. Kathryn embellished a pair of Fiber Trend clogs to look like Lady Bugs! Princess Pea is experimenting with minfulness, and is knitting positive emotions into every stitch of her comfort blanket knitted mindfully. Fricknits wants you to know that Cowl is the new scarf. med pinner has a beautiful pair of Latvian Mittens on display. If you’d like to knit like a Scandinavian, try some Two-End Knitting at Pipe Dreams and Purling Plans. Or you can try some Pansies at mind of winter! That’s it for this month! Submit your blog post to the next edition of Yarnival! using our carnival submission form. Past posts and future hosts can be found on the Yarnival! index page or in the archives. For more information about Yarnival!, visit my writeup on the subject. If you want to edit an issue, send me an email! I’m in need of editors right now (which explains why I edited this one), so if you have the time I’d love to hear from you! My Cabled Baby Jacket on a real live baby! The Cabled Baby Jacket now belongs to a real live baby. And it fits! Oh dear Lord it fits and I’m so relieved. Here are some pictures! I’m a bit squeamish about putting pictures of babies on the Internet (that’s for them to decide when they grow up), so all faces have been replaced with characters from a recent blockbuster movie-film.